They say stars are found in heaven, but we found ours soaring high in the sky impregnating a horde of masses; some voyaging to realise their dreams, some to crack business deals, while others to explore the magic of unknown lands. What can be better than giving wings to your hopes aboard Emirates A380? We urge you to take an Emirates flight when you fly to Dubai next and get a Dubai visa beforehand to avoid any goof-ups. Let’s see what’s in store for you. Say it again, free WiFi. *hoot, hoot*. That’s right. Aboard emirates A380 and enjoy free WiFi up to 10MB. Live updates on social media from air are no more a myth and your business doesn’t have to wait any more. Mandatory Instagram updates and Facebook check-ins can happen real time. On select Boeing 777s, you can pay USD1 and get the WiFi. This is absolute madness isn’t it? There’s nothing that you can’t do if you really want to do. That's what Emirates tells you. The concept of Shower Spa inside a flight is a legit thing now. There’s nothing more refreshing than taking a shower on a long flight and rejuvenating yourself on a tiring journey. Emirates’ selection of Bulgari and signature products will work magic on you. Gourmet meals catered to please your palates, culinary wonders to tease your taste buds, signature dishes from reputed chefs, wines and beverages of your choice to pair with, are a part of the ritual. 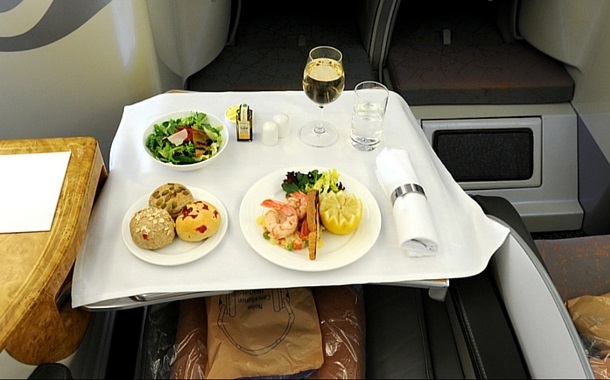 When you are in A380, meal is just not food; it is an experience that is good. 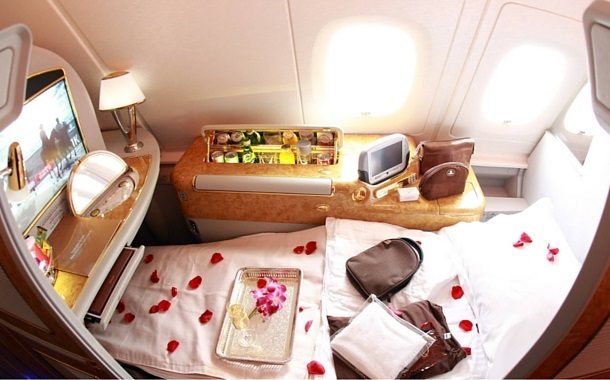 When you are on Emirates, you should not expect anything but excellence. Be it Mumbai or Dubai, the On-board lounge is your ticket to non-stop sky party. Meet like-minded travellers, businessmen and loosen up a bit all while you soak in the vivacious aura. First Class and Business Class travellers have access to this lounge, and unlimited socialising and networking goes as a bonus. Savour entrées, sip premier beverages, all while you are in an engaging conversation with your co-passenger, or friend, if I may say. While your plane zooms in the blueness of universe, treat your visual senses with a range of movies, TV shows, music channels and games. Catching up with your favourite sitcom or movie that you always wanted to watch is something you can look forward to on your flight. Bibliophiles, for once, can leave their book aside and read Open Skies, the award winning in-flight magazine. Go on a visual journey even before you reach your destination. For those who dream, sky is definitely not the limit. Emirates A380 is a universe of its own with an ecosystem that sustains the hope and faith of all humanity. The creators of experiences on Emirates will stun us with discoveries that are way beyond our amplitude of understanding. Well, if you ask me, some things are better enjoyed than figured out. 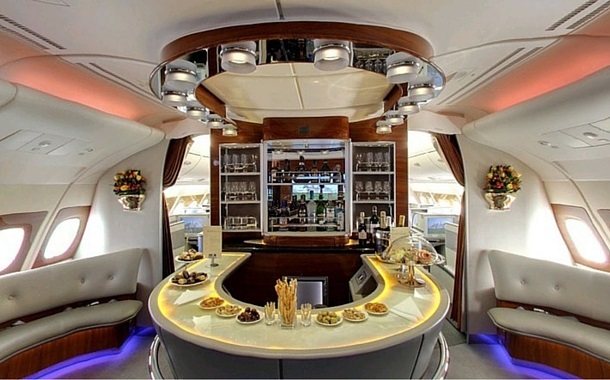 Aboard Emirates for an enigmatic experience to feel the hospitality that is truly par excellence. Book one of our Dubai packages and feel the twist of adrenaline as you float in the skies on Emirates.